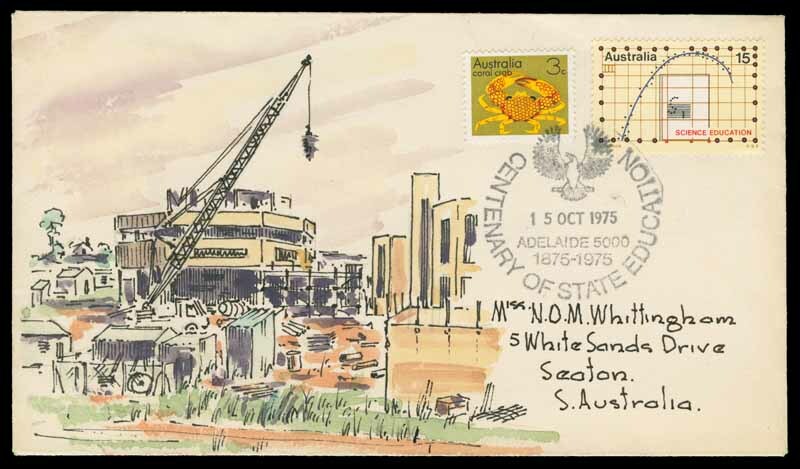 1975 Centenary of Education special postmark on Jack Peake watercolour illustrated cover, and 2 18¢ Explorer stamp issues cancelled by Ayers Rock pictorial cancellations (2), one showing Ayers Rock (Uluru), the other The Olgas, both illustrated by Jack Peake. A very attractive trio. Selection of 615 Special or Commemorative Postmarks from 1938 to 2004 including some Post Office opening or closing covers, a 1979 20¢ Norman Lindsay PSE cancelled with Purple Creswick cancellation (Catalogue $250.00) and some other useful covers. Coming from the collection of a District Postal Manager, it includes a few No 001 Registration labels. Some duplication, but good variety, with strength in the Decimal period.